Whether it's your favorite horse or dog we're not picky! 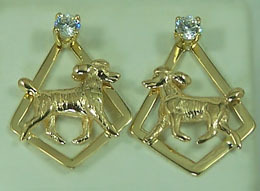 Poodle earrings with cubic zerconia studs. The Gorgeous Horse is your source for canine jewelry. Love your Poodles? Then these are for you. Beautiful poodle jackets you can use with your studs or buy the whole set. Dimensions: 3/4 inches wide x 1 inch long. Available in 14kt yellow gold or 14kt white gold or sterling silver.